Dhaka, Aug 20 (Just News): One hundred and twenty world famous scholars, academicians and writers including Joseph Stiglitz, Binayak Sen, Angela Y Davis, Ilina Sen, Judith Butler, David Palumbo-Liu Louise, and Gayatri Chakravorty Spivak in an open letter unequivocally condemned unjust treatment to acclaimed photographer Shahidul Alam. ‘A free press is a fundamental and essential element of all democracies. Its repression cannot be taken as anything but the efforts of authoritarian regimes to deny the world insight into its operations and policies. 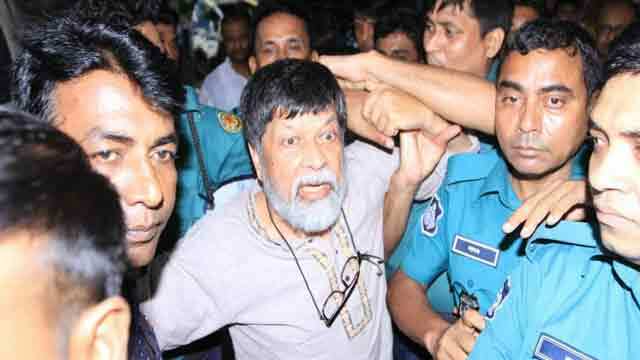 The attack on Alam at once brutalises this person and destroys the right to a free press. We condemn his unjust treatment unequivocally,’ read the letter. ‘Alam’s arrest must be seen in the context of the ongoing commission of illegal and violent acts perpetrated against demonstrators by the government and its extra-governmental actors. These acts include the use of rubber bullets fired indiscriminatingly into crowds, alleged rapes, and killings. International NGOs such as UNICEF and Amnesty International have issued statements condemning this, and others will surely follow suit,’ added the letter. ‘Alam has been detained by the police. The one and only reason he was arrested is that he gave an interview to al-Jazeera in which he expressed views critical of the Bangladeshi regime’s brutal repression of public demonstrations in Dhaka, and had allegedly posted equally critical statements on Facebook,’ read the letter. ‘He appeared in Dhaka additional chief metropolitan magistrate’s court two days later, accused under Section 57 of the infamous Information and Communication Technology Act (under constant criticism by the International Commission of Jurists for the violation of human rights and the right to free expression of all accused under the act) for online speech that “hurts the image of the nation”,’ added the letter. Signatories to the letter are —Joseph Stiglitz, Binayak Sen, Angela Y Davis, Ilina Sen, Judith Butler, David Palumbo-Liu Louise, Gayatri Chakravorty Spivak, Antjie Krog, Gioconda Belli, Costanza Caraffa, Shamoon Zamir, Nassar Issam, Rosalind C Morris, Shapan Adnan, Alexander Alberro, Meena Alexander, Ilhami Alkan Olsson, Charles Armstrong, Ben Baer, Sai Balakrishnan, Ian Balfour, Nick Barlett, Biplap Basu, Nico Baumbach, Joel Beinin, Susan Bernofsky, Moinak Biswas, Phillippe Brugiere, M Castro Varela, Latitha Chamakalayil, Partha Chatterjee, Farook Chaudry, Youssef Cherif, Meryem Choukri, Yvette Christianse, Jennifer Clifton, Clare Cody-Richardson, Rebecca Comay, Patricia Daley, Colin Dayan, Todd Davies, Rachel Deghati, Zillah Eisenstein, Michael Evans, Barbara Fields, Alwin Franke, Cynthia Franklin, Juan García-Rentería, Celine Gaubert, Akram Khan Company, Todd Gitlin, Laura Gonzalez, Nacira Guénif, Akhil Gupta, Arun Gupto, Marilyn Hacker, Kirsten Han, Michael Harris, Jan Hart, Salah Hassan, John Hawley, Samia Henni, Yeou-Shiuh Hsu, Andreas Huyssen, Rebecca Jordan-Young, Fady Joudah, Tom Kalin, Karuna Karki, Udeep Khadka, Akram Khan, Shamus Khan, Catherine LaSota, Thomas Lay, Rezaur Rahman Lenin, Tobias Linnemann, David Lloyd, Abhishek Majumdar, Reinhold Martin, Christine Maupetit, Jamaal May, Rachel McDermott, Philip Metres, D Max Moerman, Suneela Mubayi, Debashree Muhkerjee, Michael Nagler, Karthika Nair, Kartik Nair, Hilton Obenzinger, Luis Ortiz, Sandeep Parmar, Parveen Parmar, Hannah Patel, Shankar Paudel, Christopher Peacocke, Theo Peierls, Sheldon Pollock, Bibhushana Poudyal, Wayne Proudfoot, Shiva Rijal, Bruce Robbins, Armadeo Sarma, Navina Sharma, James Schamus, Avinoam Shalem, Anooradha Iyer Siddiqi, Sangita Sigdel, Shelley Silver, Razia Sultana, Shreya Sunderram, Carolina Tamayo Rojas, Mai Tassinari, Roozbeh Tazhibi, Robert Thurman, Karen VanDyck, Jesús Valesco, Kamala Visweswaran, and Julie Webber.